Whenever a new version of Firefox arrives, I know that a certain number of the add-ons I use will break. Most of them aren’t that important; my colleagues kid me that I use way too many of them anyway. But when I upgraded from Firefox 3.5.7 to 3.6 the other day, I discovered that a few of the add-ons that weren’t yet compatible were important to me. In fact, they had become such an integral part of my daily workflow that I was significantly slowed down without them. Luckily, almost all of the add-ons were updated within a couple of days so I’m back up to speed now, but I realized how much I missed them when they weren’t available. In this post I’m going to share the add-ons that I find it hard to be without. Some of us at WWD have ditched Firefox in favor of the faster Chrome (s goog), but until these add-ons are also available in Chrome for Mac, I won’t switch. In the meantime, I’m sticking with Firefox, and hoping that 3.6, the newest version, lives up to its claims of increased speed. Mozilla Prism. This add-on allows me to create a site-specific browser for locations I visit frequently. I’ve used it to create a “Google Reader” application that appears in my dock, can be placed in a separate Space, and operates separately from Firefox. I’m not sure why Mozilla hasn’t updated this yet; I’m using Chrome to view Google Reader for now. LastPass. This password manager not only keeps track of my passwords, it syncs them between browsers and computers. I imagine most web workers have as many passwords as I do — they’d be impossible to keep track of without a program like LastPass. I also use 1Password for the Mac, and sync its data using Dropbox, figuring that it doesn’t hurt to keep such important data in multiple places. Xmarks. This handy extension syncs my bookmarks between browsers and computers. Adblock Plus . I appreciate all of the content that is available on the web, including WebWorkerDaily, thanks to the support of advertisers. But some sites have such obtrusive advertising that they are unusable. Google (which makes most of its money from advertising) is allowing ad blockers in its Chrome browser in the hope that advertisers will make “useful” ads that no one will want to block. Until then, Adblock Plus is a necessity for me. Gmail Manager. This is the Firefox add-on that I use the most. 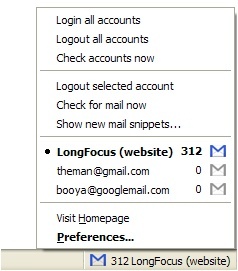 It’s the best way I know to manage multiple Gmail and Google Apps mail accounts. I’ll also add two tools that are incredibly helpful to web developers: Firebug and Web Developer. Both help me and my colleagues to test and debug web sites. …and finally, Cards. Well, OK, I guess I can live without this one, but I’ll have find something else to do while I’m on the phone. What browser add-ons do you rely on? Sorry for the question and not a comment — but do you know if any SEO-specific FF addons work with Prism? I cannot find much in the way of documentation (and even if I could, I’m not sure if I could decipher it). Looking for SEO addons that show pagerank, nofollow, # of backlinks, etc. My favorite add-on: SEO for Firefox (by aaron wall)! None of the addons work on 3.6 Not one. I keep getting error 203. I’m disappointed. Is it because I have the Micro$oft XP? I haven’t seen this error, but it’s apparently caused by corrupted configuration files and/or firewalls. Do a search for “firefox error 203” and you’ll find several sites that discuss the issue, and fixes for it. ColorZilla – don’t use it much, but it’s handy for getting an RGB when you need it. PDF Download – sends my pdfs to Foxit rather than opening in a browser. Firebug is awesome. I remember watching a tutorial video on drupal last year and saw the developer using Firebug to look over some of the code. I use it every day; can’t imagine editing CSS without it. P.S. YSlow (https://addons.mozilla.org/en-US/firefox/addon/5369) and Mozilla Labs Test Pilot (https://addons.mozilla.org/en-US/firefox/addon/13661) are on the “remember-to-install-when-convenient” list. IE Tab. Started to download the Firefox update, but noticed that IE Tab wouldn’t be supported in the new version, so will wait. IE Tab allows you to right-click on a link or page and view the page in Firefox in an Internet Explorer tab. It’s great whenever a page is acting goofy in Firefox. I probably use it a half a dozen times a day. FoxClocks, Forecastfox, ShareThis, Facebook Toolbar, Delicious Bookmarks, Google Toolbar, Adblock Plus – can’t live without them. Nice list. One of my fav add-ons is Shareaholic. I haven’t used Gmail Manager before, but it sounds like an add-on I will use a lot in the future. Thanks, Lizzy, that’s my fault — an incomplete edit. I have fixed it.